Our four-legged friends keep us entertained, offer us companionship when we need it most and are overall bright spots in our lives. As such, shouldn’t they be comfortable and safe when they accompany us on our various travels? With the best pet carriers for travel on Amazon, your feline friends, canine companions, and other irreplaceable pets are sure to travel with less stress, be less cumbersome to carry around the airport or crowded coastal streets, and overall enjoy their experience more; which, of course, is bound to make you smile. 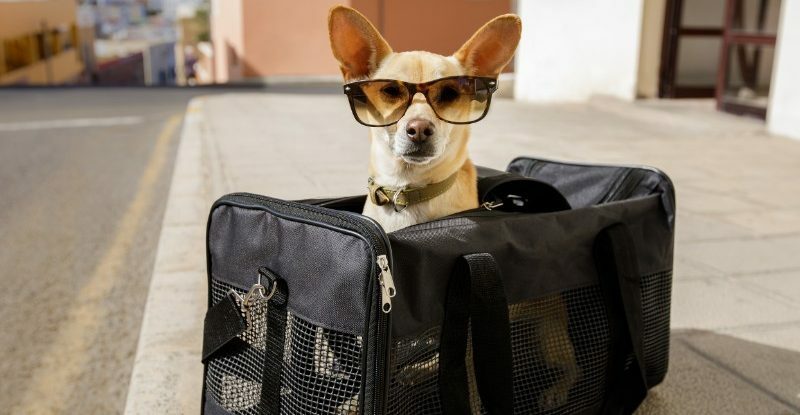 Whether you’re navigating an airport concourse or perusing local shops in a cute downtown, it can often be easier on you and your furry friend if they don’t have to walk the whole time. From crowded streets to cumbersome leashes, there are several drawbacks to allowing your pet to walk with you in public, but those problems are solved with the Snoozer Wheel Around Pet Carrier. The breathable mesh construction not only keeps your companion comfortable and safe but it also allows them to see and experience the world with you. When you’ve stopped for lunch or found the perfect seat to kill some time at the airport, this carrier easily converts from mobile to stationary. It’s the perfect option for on-the-go pet lovers. Available in several different sizes, the AmazonBasics Folding Dog Crate is a fantastic option for those who need a simple, durable way to keep their favorite canine safe and secure during travel. It features two slide-bolt door latches to ensure that your pup stays where it belongs and is constructed of sturdy metal, ensuring that you can use this crate for years to come. The thoughtful design incorporates mini dividers and a removeable plastic pan to make sure your dog’s paws don’t slip through any cracks, causing injury. This crate even folds flat when not in use, allowing it to be stored and transported with ease. One of the key features to look for in a pet carrier is its airline approval. The Pet Magasin Luxury Cat Carrier is here to put your pet air travel worries to rest—it is approved as a carry-on for all major airlines. It is sized perfectly for cats, but can also comfortably house small dogs, puppies, and other small pets. When the end panels are zipped up, the carrier retains its shape, allowing your pet to remain as safe as possible. Despite its clever and functional design, this carrier manages to be exceptionally lightweight and even fashionable. It weighs in at just over two pounds even with its impressively soft yet durable padding. It also features mesh windows for ventilation, a handle and shoulder strap for easy carrying, and a fold-flat feature for storage! For the curious kittens out there, no carrier is better than the PetLuv Happy Cat Carrier. It features optimum ventilation and visibility thanks to its generous inclusion of windows. The windows this carrier uses are not your standard run-of-the-mill windows, though; they’re made of heavy-duty rubber mesh that is tear-resistant and even features closable flaps for inclement weather. When used in the car, this clever carrier can be safely secured with the built-in adjustable seatbelt loops. It even includes a removeable, washable bed that is the pinnacle of on-the-go pet luxury. There are plenty of color choices and carrier options to choose from, so make sure you take a look and pick the best combination for you and your feline friend! The innovative design of the Sherpa Travel Pet Carrier sets it apart from the mass of other offerings on the market. It’s perfect for travel, no matter what method is used, and incorporates a few innovative features to prove it. For example, the rear of the carrier features a patented spring wire frame that allows it to be pushed down, successfully conforming to the under-seat requirements that airlines have. On top of that, this carrier has plentiful mesh windows for ventilation, but doesn’t compromise safety—all the zippers are lockable, keeping your pet safe and secure. It also has a built-in pocket that is the ideal storage place for treats, leashes, bags, toys, and anything else your four-legged friend may require. While collapsible carriers certainly have their advantages, sometimes a sturdy hard-plastic carrier is the better option. The Petmate Kennel takes the idea of safety and durability to heart by producing a carrier that utilizes both reinforced plastic and steel to ensure safety and durability use-after-use. It does not compromise on features you would expect from a quality pet carrier, either. take, for example, the top-loading door that makes placing your pup in the kennel as easy as possible. There’s also plenty of ventilation thanks to the clever design of both the carrier itself and the grated door. You also don’t need to worry about the kennel being too bulky—it includes a handle that is easy and comfortable to grip and meets the majority of airline cargo specifications. While it is specifically designed to meet airline specifications, the PetPeppy Expandable Carrier is packed with features that make it unique. It has a ventilated roof that allows for constant air circulation, meaning your pet will always be happy and healthy when in the carrier. The materials used have a premium feel to them, but remain incredibly durable, giving comfort to your pet and peace-of-mind to you. It even includes a cushioned bed and external storage compartments, once again allowing it to exceed the expectations of both you and your furry friend. Best of all, it has a dual-expansion design that allows the carrier to expand from a compact carrier to roomy luxury for your canine (or feline) companion. The AmazonBasics Two-Door Kennel is all about durability and convenience at a competitive price. Constructed of plastic and steel, this kennel is bound to provide years of quality use despite the trials of travel. The top-mounted handle makes carrying this kennel a breeze, whether it’s to and from the car or around the airport, while the dual doors allow easy access to the interior of the kennel. The top door can even be opened to the left or right—a feature that is easy to overlook, but provides invaluable versatility when in the confined spaces of travel.